Though it was only released yesterday morning, iOS 7.1 has already been installed on 5.9 percent of iOS devices in North America, according to a new report from analytics firm Chitika. To get its numbers, Chitika measured ad impressions from tens of millions of iOS-based devices in the U.S. and Canada from March 9 to March 11, 2014. The adoption rates are similar to those of iOS 7.0.6, which offered a critical security fix and was installed on 13.3 percent of iOS devices 48 hours after release and 25 percent of devices after four days. As with most minor version updates, iOS 7.1 adoption rates have been less dramatic than those of its major-version counterparts. In the 24 hours following the operating system's public release, iOS 7.1 users generated 5.9% of total North American iOS Web traffic. iOS 7.1 offers CarPlay support, Touch ID improvements, bug fixes, and several visual tweaks for iOS, including revamped shift and caps locks keys for the keyboard, refined icons for the Phone, FaceTime, and Messages apps, and a redesign for several aspects of the Phone dialer and shutdown screen. Beyond iOS 7.1, iOS 7 users generated more than 80 percent of all iOS web traffic over the three days Chitika measured, a number that has remained steady since the company's previous February 26 study. 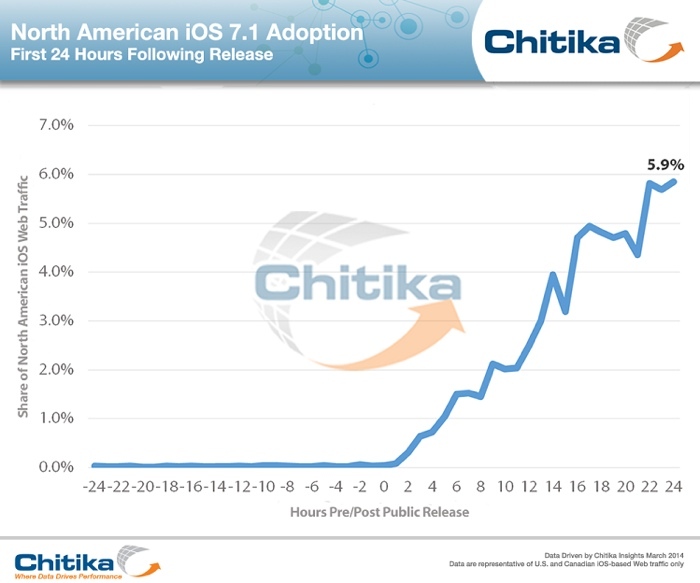 Chitika's overall iOS 7 usage numbers in North America are in line with reports from Apple's App Store support page for developers, which indicates 83 percent of all iOS devices have iOS 7 installed as of March 9, 2014. Is the first half of that chart really necessary? It isn't a "minor update" at all. 7.1 actually makes my iPad 3 usable again! 7.0.x was sooooo sloooowwwwww. Why is the chart designed to make 5.9% look like a huge number? It's a small number and a 0-100% scale would show that. 6% in 24 hours is a huge number in the contest of mobile OS upgrades. Hell other popular platforms (that pretend to be open) would be happy to see 6% upgrading in 24 months. What I want to know is how does someone revert from 7.1 to 7.0.6? I find it odd that they don't make it more obvious to non "Apple-obsessive-macrumors-readers". It seems like it takes quite a few days for the badge to come up on the settings app. My parents have no idea what it means and don't update until I do it for them. I don't find it odd to not want your servers to have a complete meltdown, and Apple is in no race to beat adoption records on a third-party chart. For those who are antsy like the lot of us here, you just tap software update in settings to invoke the check and get it sooner. Otherwise, I think an OS update rolling out to hundreds of millions of users over the course of a few days works just fine for those who don't read tech blogs. Why does a 214 MB update require 1.9 GB of free space? Its so frustrating! I can't update because of it. I'm really pleased with this update. - iPhone works better; no crashes or anything. - change to phone app are aesthetically pleasing, nothing more than that. - really like the changes to the camera app; auto HDR is awesome. 6% adoption in just 24 hours is justin credible. Nobody else can deliver these numbers. Only the Apple ecosystem has this capability. Celebration time, again! "Rushed iOS Update Another Apple Bomb: a Full Day Before Release, Customers Staying Away in Droves"
5.9% of a couple million or more ios 7 adopters is pretty good for an update with no prior notice. A 100% scale would distort how massively well these updates get out to users, compared to other platforms. (Which would have made an interesting comparison graph: how quickly did the Android user base reach 6% on the latest version?) 100% wouldn't show anything useful--it would be like showing murder rates--.1% vs. .5% would matter matter, while comparing to a hypothetical 100% of people being murdered would flatten the difference into a meaningless line. That said, they really only needed a number--not a picture--for this story.